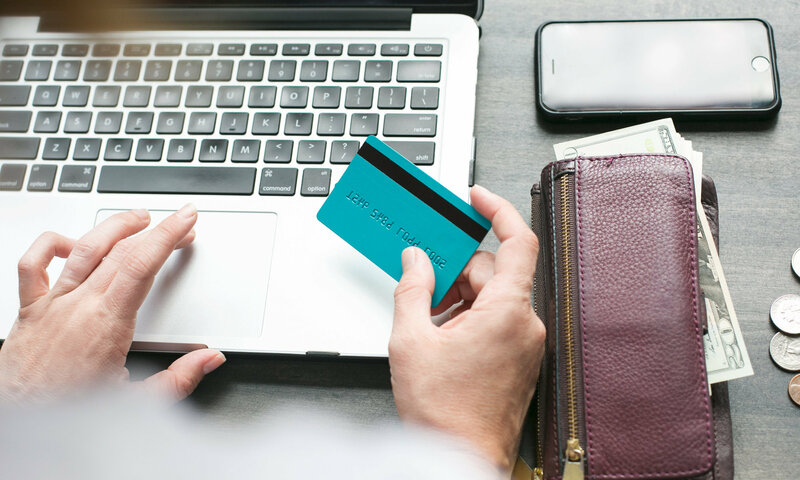 Whether it’s your side hustle or a full-time venture, juggling all your tasks can be difficult if you’re the only one managing your eCommerce business. You need to upload and categorize products, manage and ship orders, negotiate with vendors, and conduct online marketing, all by yourself! Sure, many of these tasks will get easier over time, especially if you do them every day. But improving the visibility of your online store still requires consistent effort. In the world of online marketing, where most marketing channels like Google Shopping and social media require a budget, SEO is the only way to get more traffic to your store without having to spend a single penny. And one indispensable factor of SEO is eCommerce keyword research. 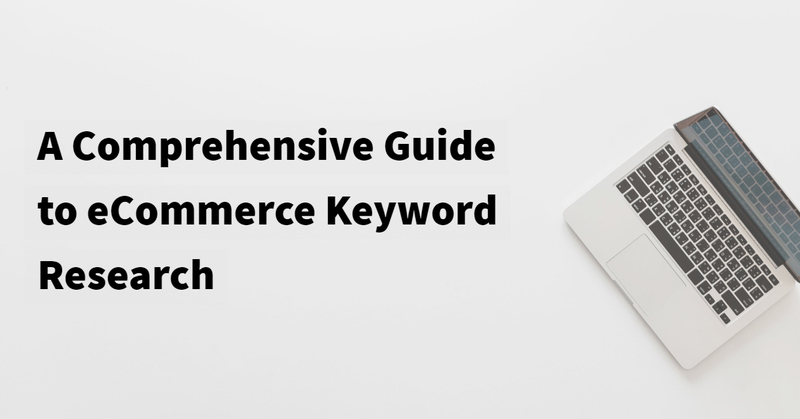 This guide aims to establish repeatable guidelines for eCommerce keyword research to help your business get more sales organically. Why is eCommerce keyword research important? 1. What is a keyword? A keyword is a word or phrase that people type into search engines like Google. Because people often search with the intention of buying products or services, you can use these keywords to improve the visibility of your store. More traffic means more sales! For example, if you have an online store that sells wrist watches, your potential customers would search for “wrist watches” or “wrist watches for men”, so these would be relevant keywords for your business. 2. Why is eCommerce keyword research important? Keyword research is about understanding what your potential customers are searching for and getting your website to rank in Google for those search queries. Google displays 10 organic search results per page for every search query, and the first three results on the first page get almost 60% of the traffic. Therefore, it’s important to not only rank on the first page but also try to reach one of the top three results. In short, eCommerce keyword research is imperative to get your website to rank well for relevant search queries. It will make a huge difference for your business, as the closer you get to the top of Google’s search results, the more traffic you’ll get and the more sales you’ll achieve. Once you understand keywords and their importance to your business, it’s time to start trying out free eCommerce keyword research tools. There are several keyword research tools available online, most of which require a paid subscription to use. However, there are a few eCommerce keyword research tools you can use to build a keyword list for free. GKP is a free tool developed by Google to help you find keywords relevant to your business. It shows you a range of average monthly searches for each query (but not an exact number), and you can look up as many keywords as you want. In the above example, the average monthly searches for “wrist watch” are in the range of 10k–100k. This means that more than 10,000 people search for “wrist watches” on Google every month. This is a high search volume, so it’s a valuable keyword for your business. For a low-volume keyword (10–100 or 100–1k monthly searches), you’ll need to find out its exact search volume to decide whether or not to target it. The keyword “silver watches for men” has 100–1k searches a month. This could be any number from 101 to 999. If the search volume is closer to 100, you probably don’t want to target this keyword. However, if it’s closer to 1000, it may be worth trying to rank for. KWFinder is another eCommerce keyword research tool you can use to look up the search volume for any keyword. Not only will it show you an exact number, it will also indicate keyword SEO difficulty, which is important for your content plan. Keywords with a lower difficulty level are easier to target, whereas keywords with a higher difficulty level take more time to rank for. The keyword “silver watches for men” has a search volume of 582 and a difficulty level of 47. This means about 582 people a month search for “silver watches for men” and it’s an easier keyword to target. With this tool’s accuracy, you can now decide whether or not this keyword is worth targeting and better define your content plan and SEO strategy. KWFinder is an extremely useful tool, but there’s a catch: it’s not completely free to use. After registering on KWFinder, you get 5 free searches every day. Use these searches wisely! When conducting eCommerce keyword research, we recommend searching for keywords on Google Keyword Planner first, then searching for low-volume keywords on KWFinder to determine their exact search volume. SEMrush is an SEO analytics software that provides insights on keywords, website traffic, projected AdWords spending, and other SEO-related data. Like KWFinder, it also shows the exact search volume of any keyword. With SEMrush, you can find keywords that your competitors are ranking for. Enter a competitor’s URL and open “Keyword Analytics” to find their list of keywords, then adjust your content strategy accordingly. Note that like KWFinder, SEMrush gives you a limited number of free search queries (10 free searches a day). Unlike KWFinder and SEMrush, Ubersuggest is 100% free to use. It shows you the exact search volume of any keyword with no limit on your daily searches. Along with search volumes, this tool gives you hundreds of ideas for long-tail keywords, which are extremely useful for targeting a specific audience. Every time you search for something on Google, the search engine will display related queries at the bottom of the page. These are keywords that users often click if they don’t find what they’re looking for, so you should include these in your list of relevant keywords for your products. 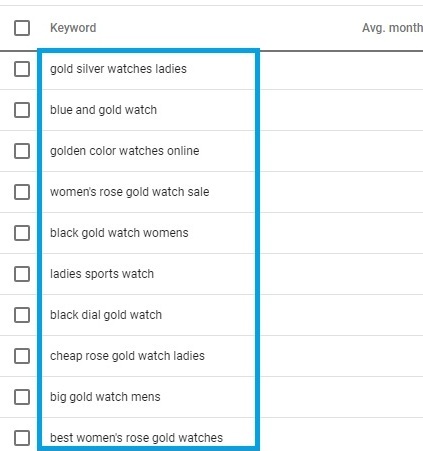 If you’re targeting “silver watches for men”, try to incorporate all the related keywords into your content for an advantage over your competition. Make sure to enter every keyword you target in the Google search bar. When searching through Google, users don’t usually type the entire phrase, instead clicking on one of the queries suggested by Google beneath the search bar. Use these keywords in your content to increase your chances of ranking for a suggested search query. While running an eCommerce website, your primary goal is to get more sales. Therefore, you don’t want just any kind of traffic; you want traffic that converts. Not all organic traffic leads to sales. Some keywords, while relevant to your business, won’t drive traffic from your target audience. The average monthly search volume for “wrist watch” is over 33k, but that doesn’t mean all those people are looking to buy a wrist watch. Most of them are probably just searching for information about wrist watches. Therefore, though you want to rank for this high-volume keyword, the traffic you get from it may not earn you an equally high volume of sales. So how can you find eCommerce keywords that are relevant to your business and that earn you sales? To get traffic that converts, focus on specific long-tail eCommerce keywords. The average monthly search volume for “big dial watches for ladies” is 1300. Although this is lower than the search volume for “wrist watch”, users who search for “big dial watches for ladies” probably intend to buy this specific kind of watch, so the traffic generated by this keyword will have a much higher conversion rate. Long-tail keywords tend to have lower search volumes, but because they’re specific, the intent behind them is much clearer and easier to target. As a business owner, your goal should be to compile a list of keywords for your eCommerce website content—product descriptions, blog posts, product names, etc.—that drives sales. This section of the guide explains the final part of eCommerce keyword research: when you launch your store. Every business has competitors, and yours is no exception. Identify your closest successful competitors, then go to SEMrush and enter their URLs. Go into “Keyword Analytics” and look for the top keywords they’re ranking for. Now you can make a list of those keywords and incorporate them in your content. Your competitors’ keywords will be highly relevant to your business, so make sure to target these keywords with high-quality content. When building a keyword list, always focus on long-tail keywords, as these have more potential to drive sales. You can use the tools mentioned in Part 3 to find long-tail keywords related to your business. By targeting these keywords, you will narrow your traffic down to the most relevant users. Just make sure to only use long-tail keywords that are relevant to your products. There’s no point in using a keyword like “men’s rose gold watch” when you don’t have this product in your store. It will take a long time for your website to rank for these keywords, so start small instead. Target keywords with lower search volumes and low competition. For instance, if your store sells golden watches for men, search for all related keywords in GKP and use these in your URLs, product descriptions, and product images. When it comes to improving the visibility of your eCommerce website, keywords are just the beginning. Keep producing content with relevant keywords and over time you’ll see a rise in organic traffic, and with it, more sales. SEO takes time and effort, but the rewards will go a long way, and all for free!